Mr. Shahrokh Zamani, a member of the Painters’ Union of Tehran and a member of the Follow-Up Committee to Set Up Free Labour Organisations in Iran, is a popular and well-known labour activist. He was arrested on June 5, 2011 without charges, and was then subjected to physical and psychological torture for the next forty days. He has been charged with trumped up charges such as “spreading propaganda against the regime and forming socialist groups“ and sentenced to 11 years in prison. Mr. Zamani has been subjected to further torture by placing him with common criminals and unleashing attacks by violent inmates on a daily basis on him and other political prisoners. He, along with other political prisoners, has been deprived of his right to furloughs, day passes, and conditional release. The Occupy Edmonton, who represents the struggle of 99% against injustice, inequality, and oppression, strongly protests against inhumane treatment of workers and prisoners in Iran. We believe that the right to assemble, organize, protest, and strike are very basic human rights to all workers and social activists. We strongly support the struggle of workers and people of Iran for freedom, equality, and a better life. 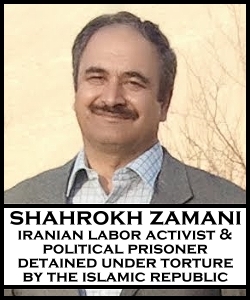 We demand the immediate release of Mr. Shahrokh Zamani and other political prisoners.